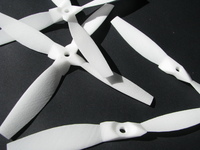 Micro Multicopter Frames R1 by PolakiumEngineering is licensed under the Creative Commons - Attribution - Non-Commercial license. These micro multicopter frames are designed to not only look amazing, but to provide a strong and lightweight frame. The arms are interchangeable and easily replaceable between frames. Each motor is sunk into the arms in order to reduce vibrations and provide for a much cleaner looking mount. The spider quad frame can be used for fpv with a micro camera. I have not yet received my 3D printer, so this design remains untested. Each arm is secured to the frame with 3x 3mm plastic cable ties. The stock Turnigy motor mounts are removed by unscrewing the two grub screws. A small amount of CA glue is applied mid-way up the base of the motor (away from any moving parts) and the motor is then press fit into the end of each arm. The flight controller is mounted to the integrated standoffs using the four press fit pins or M3 self tapping screws. The lower plate of the frame allows for placement of a Velcro strap suitable for 2S LiPo batteries with a width of about 35mm. The hexacopter frame has two locations for securing the Velcro straps to the frame, this helps secure the longer 2200mAh batteries. Say thanks by giving PolakiumEngineering a tip and help them continue to share amazing Things with the Thingiverse community. We're sure PolakiumEngineering would love a Tip, but unfortunately they have not setup their accounts to receive them yet.